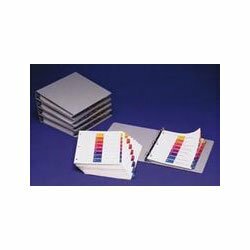 Print or photocopy titles framed with bright multicolors that match the preprinted tabs on white dividers. 24 uncollated sets per box. Made of 11 pt. 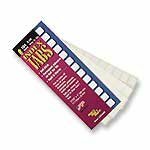 manila tag stock with three 1/4" punched holes for standard letter size ring binders. Create customized dividers that look professionally printed using your existing software and a laser or ink jet printer. 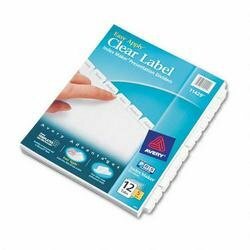 Clear labels virtually disappear when applied to the Index Maker Divider tabs. 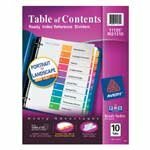 Preset layouts in Microsoft Word, WordPerfect, and other popular software programs make formatting easy. 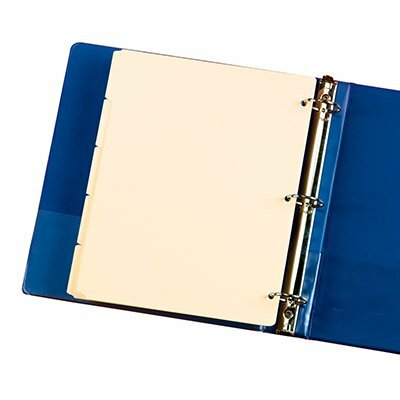 Modern design translucent plastic dividers. Three-hole punched. Includes Easy Apply Label Sheets. Three-hole punched. 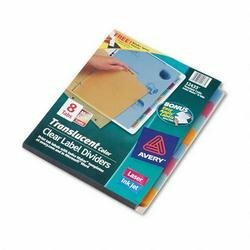 Format and print customized clear labels using your computer and existing software then apply them to the tabs of 11 x 8-1/2 Index Maker Dividers. 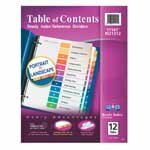 Preset layouts in Microsoft Word, WordPerfect and other popular software programs make formatting easy. Contains 20% post-consumer recycled content. Includes Easy Apply Labels sheets which adhere all at once to divider sets to save valuable time. 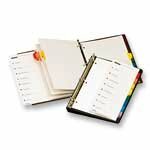 Indexes feature double, gold-reinforced binding edge. Heavy-Duty, 32 lb., buff ledger stock provides maximum strength against tearing. 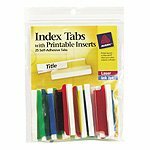 Five large 2" and eight large 1-1/2" clear tabs accommodate long titles. The original multiple index set. 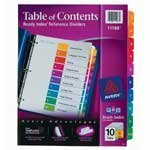 Cardinal'S OneStep organizes multitudes of binders as easily as one. Type the descriptive information on the exclusive ReproMaster Typing Guide and photocopy onto contents sheets. Contents page numbering matches the corresponding numbered tabs. 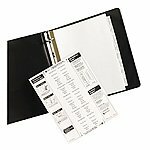 Extra-Tough ring binder poly pockets outlast paper pockets. 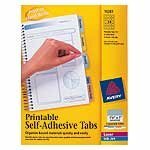 Features tear- and fray-resistant construction, double-sided pockets, and three-hole punch insertion. 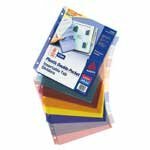 Hold full-size 8-1/2" X 11" sheets. Sheet size: 11" x 8-1/2".